The Fitbit Surge is the company’s first true sports tracking wearable aimed at those who love running, cycling and working out. 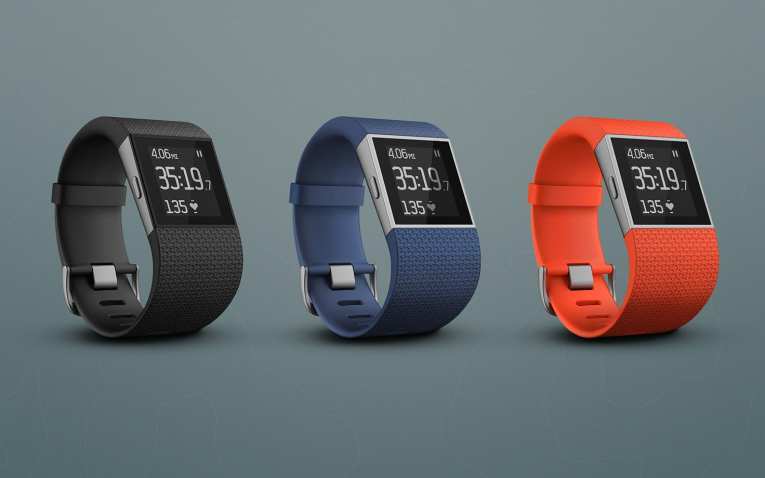 Fitbit has described the Surge as its “most advanced tracker to date”, and withoptical heart rate sensing and GPS built-in, it’s more than a match for sports watches from likes of Garmin and Polar. After strapping it on for the original review we’ve gone back and revisited it with the addition of Fitbit’s new cycling mode. 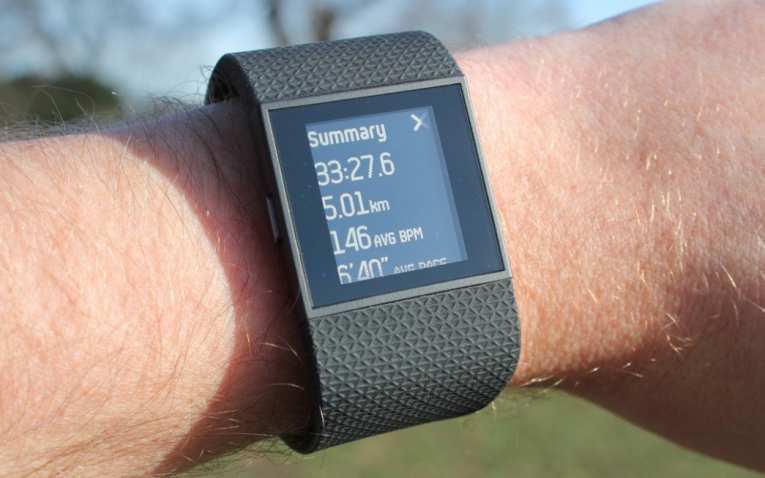 Read on for our full Fitbit Surge review. Unlike the Fitbit Zip and the Fitbit Flex that came before it, the Surge shuns the traditional activity tracker band form factor and it’s definitely moresmartwatch than fitness tracker. However, while the Android Wear brigade are hardly fashionista head-turners (the LG G Watch R and the Asus ZenWatch are semi-stylish rather than stunning) they do somewhat put the Surge to shame when it comes to aesthetics. The Fitbit Surge’s rubber strap, which comes in black, blue or tangerine looks nice enough and, crucially, is both comfy and secure, but it’s hard to look past that dated looking display and the increase in girth from the modules bottom to top end is rather bizarre. The display is a rather drab looking touchscreen monochrome 1.25-inch LCD number that uses a plethora of greyish blue variants for its different homescreens and menus. There’s a solitary button on the left side for switching between the live view mode of your daily stats and the function screens (this also switches from a light on dark to dark on light colour setup) and the two buttons on the right are used as selection inputs. This physical and capacitive control arrangement works well however; it’s easy to navigate around the Surge’s options and features without getting lost, and we’ve had absolutely no issues with touchscreen responsiveness, even in the pouring rain. The LCD screen has a backlight so it’s also usable in low light situations – you can toggle this light on or off, or set it to automatically come on when in use – through the settings menu on the device itself rather than having to use the app. Stupidly, if you want to change the watch face – there’s four to choose from – you do have to use the app, the settings on the device only extend to the backlight, switching notifications on or off, toggling Bluetooth, setting the heart rate monitoring power options and turning the Surge off. 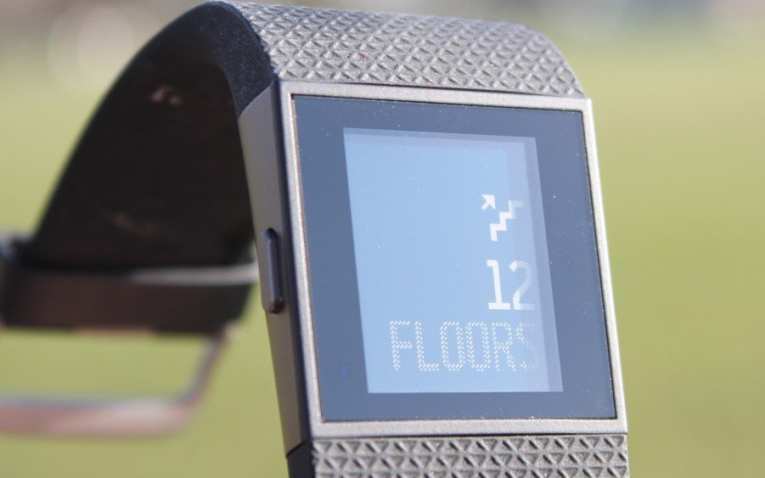 Fitbit’s raison d’etre, up until this point at least, was everyday fitness tracking – so let’s kick off with that aspect of the Surge’s armoury. 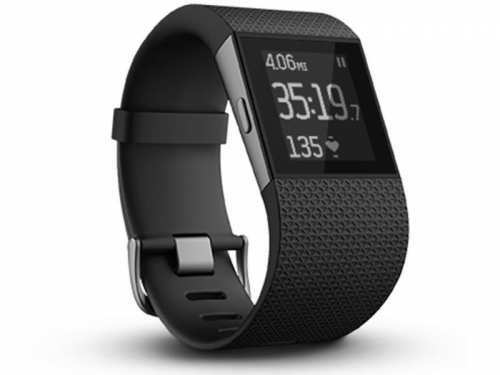 The Fitbit Surge is capable of tracking steps, distance travelled, calories burned, floors climbed, elevation and active minutes thanks to its 3-axis accelerometer, a 3-axis gyroscope and digital compass. These stats are not only synced to the Fitbit app (which we’ll come to in more detail later) but are also displayed on the device’s display. From the regular clock face you simply swipe left and you’ll see all your daily totals on display. It’s incredibly easy to use and much less fiddly than opening up an app to see how you’re doing, as would be the case with older Fitbit devices, as well as incoming rivals like the Jawbone UP3. 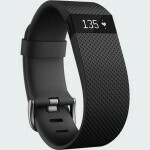 The activity tracking is, as you’d expect from a company with plenty of experience in this area, incredibly reliable (we tested against older Fitbit models, as well as rival activity bands) and the Surge does a great job of motivating thanks to the ease of seeing how well you are performing against your goals. There’s also sleep tracking with the Surge and, like the new Fitbit Charge models, your zzzzs will be monitored automatically (unlike the older Flex which required a manual, push of a button sleep command) and there’s a vibration-based silent alarm on offer too. The Surge records days of detailed motion data, minute by minute, and keeps tabs on your daily totals for a month. It can also store heart rate data at 1-second intervals during exercise tracking and at 5-second intervals all other times. 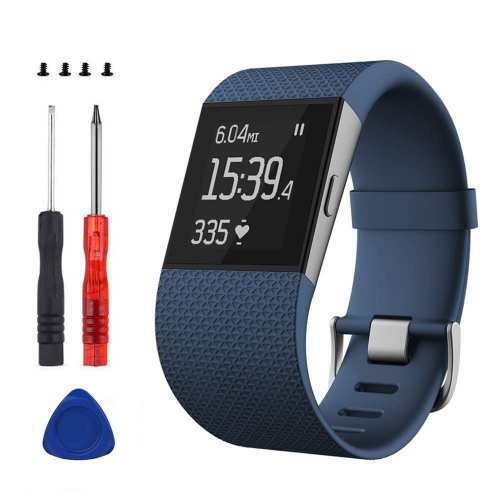 24/7 heart rate monitoring, using Fitbit’s new PurePulse technology (that is also found in the Fitbit Charge HR), is a major feature of the Surge and puts the device squarely up against the likes of the Basis Peak and the Microsoft Band. It means that, not only can you use the built in optical heart rate sensor to guide you during runs and workouts, and allow you to do detailed bpm training, you can also monitor your resting heart rate everyday, allowing you to monitor it over time and see what events and activities in your life cause it to fluctuate. Fitbit’s PurePulse tech uses LED lights (you’ll see them on the back flashing green as you remove the Surge) to detect your blood volume changes as your heart beats and, combined with the company’s algorithms, you’ll be able to get a more accurate calorie burn figure and keep a closer eye on your health. 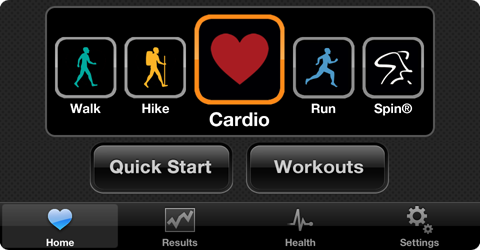 You will of course, as already mentioned, also be able to train within heart rate zones and maximise cardio workouts. We tested the Surge’s bpm skills against a couple of other optical heart rate sensors (including the new Mio Fuse band) and found the results to be pretty consistent. So while an optical, wrist-based, heart rate monitoring isn’t likely to be as accurate as a dedicated chest-strap, we’d say the Surge is as reliable as any of its main rivals for a general gauge of bpm performance. The next big function that helps the Surge stand out from the crowd is the inclusion of GPS connectivity. 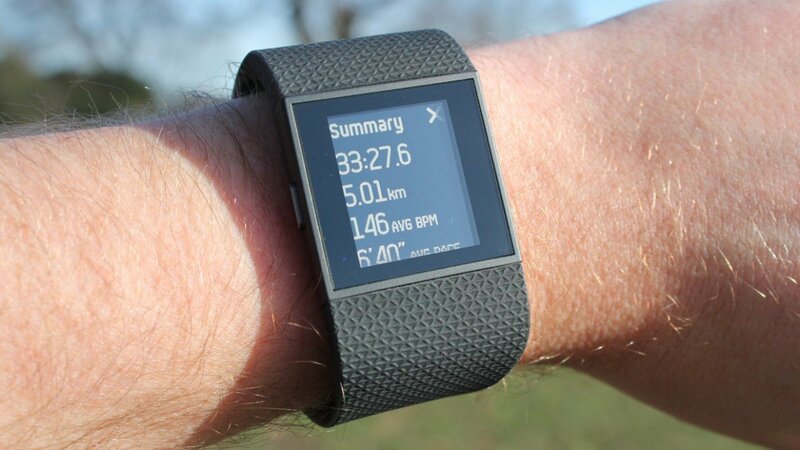 This means that you can now track runs using a Fitbit wearable without the need to take your smartphone out and about with you as well. 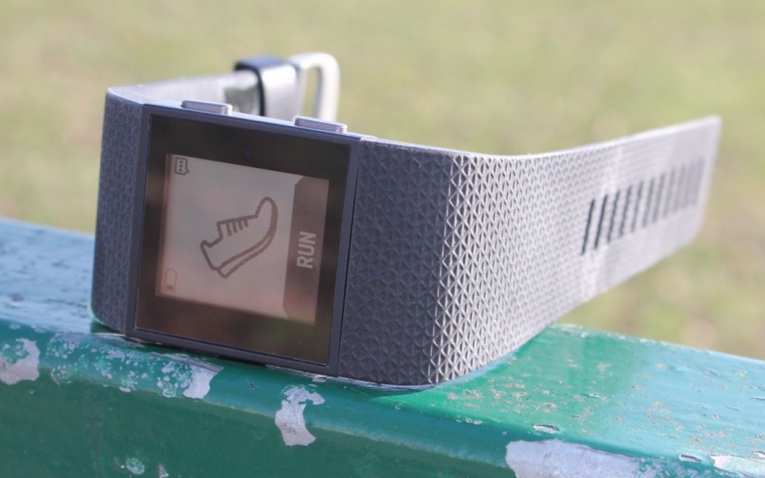 Essentially, it puts the Surge head-to-head with dedicated GPS running watches but its main rival is probably the activity tracking hybridPolar M400 that also has GPS smarts. It’s easy to start a run with the Surge, simply navigate to the main running homescreen and select the type of run you want: free, lap or treadmill. 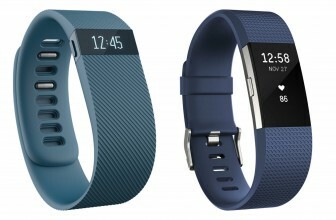 The first one is the one you’ll use most, the second allows you to press a button to record lap times and the third is a non-GPS option that uses the step algorithm to track your gym jogs – it’s best to calibrate your stride length within the Fitbit app if you’re going to be doing a lot of these. For the GPS running the satellite lock is pretty quick – faster than an Adidas miCoach Smart Run, not as fast as a Polar M400 – and once you’re off you’re presented with the running display, which shows distance, time and pace. Swiping to the left swaps pace for steps, calories or heartbeat but there’s no way of changing the other two metrics, or the order things are shown. Now, while GPS tracking is the only real way of accurately tracking a run, there’s always some discrepancies between devices – even ones made by the same manufacturer – due to the satellite being used, the strength of the signal, interference and so on. However, these discrepancies are usually around 2-3% at most. We twice tested the Surge against the Adidas miCoach, and once against both the Sony SmartWatch 3 and Polar M400 and found that, over 5km, the Surge claimed we ran 420m less than the miCoach and, over 10km, 700m less than both the Polar and Sony recorded. That’s 7-9% different. Not ideal, especially given that we tested it against devices giving consistent results, and ones that we had proved reliable in the past when compared to rivals themselves. 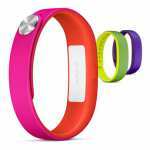 You can set up the Fitbit to record other sports – weights, golf, circuit training, yoga, golf, tennis, hiking and a load more – and you can also choose which ones of these sports you want to include within the Exercise area of the device itself. These sessions are then automatically synced within your log on the Fitbit app, with heart rate data and, if applicable, GPS data on offer. However, these sessions are essentially just labels for the app. The golf function, for example, has no course data and won’t record your shots – it will simply map your route using GPS, calculate the distance you walked and keep tabs on your bpm. An ominous omission from the Fitbit Surge at launch was a dedicated cycling tracking feature, which was a big drawback for bike lovers. 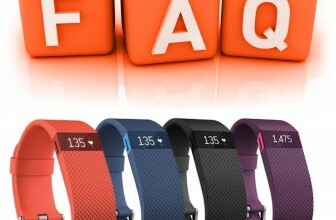 However, Fitbit has added a new Bike Mode to its exercise line up. The mode brings the same level of detail as Surge provides for running, with time, pace and heart rate zones provided. The app provides graphs and charts of your session, as well as a map of your route. However, the mode isn’t as detailed as we’ve seen with body mounted wearables, such as the Wahoo Tickr X, which can record cadence, which is an important stat for cyclists. It makes the Surge a useful watch for cyclists, but like much of its reporting, it doesn’t quite match the immense detail of specialists sports tracking wearables from the likes of Garmin. The Fitbit Surge syncs to your smartphone app using Bluetooth, or your PC or Mac using a wireless dongle if you don’t have access to an Android, Windows Phone or iOS device. Once synced with the mobile app, data is stored in the cloud and will appear on the slightly more in-depth desktop version too. Your data will also sync with the info from your Fitbit Aria Wi-Fi Scale, and brings in your data from your old Fitbit devices as well. When syncing your Surge to the Fitbit app – the same app you’d have been using already for your old Fitbit device – you’ll be asked if you want your new super watch to replace the existing stored wearable. The Fitbit app can’t handle more than one tracker at a time and you’ll have to delete your existing Flex, for example, before you can pair your Surge. During our Fitbit Charge review we mentioned this is a bit silly as wearables should be chop-and-changeable: surely Fitbit would benefit by letting users don multiple devices? This setup discourages users from getting both a Charge and Surge. The Fitbit Surge section of the app lets you see your step count, your current heart rate, the distance you’ve covered, calories burned, floors climbed, active minutes and also lists all your workouts. From within each of these you can select to see more info and be presented with a plethora of graphs and historical date (daily, weekly, monthly). The app also allows you to record extra workouts, share and compete with your friends, log your food intake and earn badges based on your activity achievements and you can also use the app to change some of the settings for the Surge. 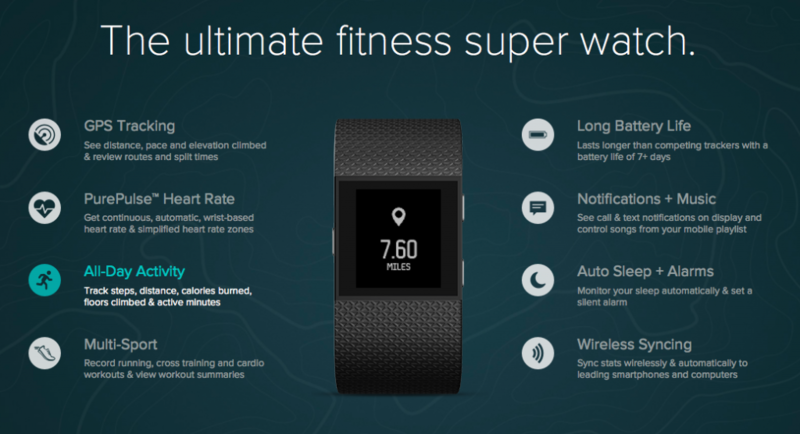 The Fitbit Surge is not a smartwatch. In terms of smartphones notifications you’re looking at incoming call alerts, missed calls and text messages. And that’s it. You can forget about WhatsApp, Facebook, Twitter and the like – the Surge doesn’t even offer native app updates like emails and calendar reminders. A crying shame and certainly not what you’d expect from a ‘super watch’. We hope Fitbit adds extra notifications soon, the likes of the Garmin Vivosmart and the Sony SmartBand Talk offer third-party app support and even the Acer Liquid Leap has calendar reminders. Smartphone music control is on offer, but only during workouts. The display shows track info and you can skip, play and pause using the physical buttons. Fitbit seems confused about two things when it comes to the Surge: Battery life and water resistance. On the Surge’s official webpage it states that the battery life is both “up to 5 days” and “7+ days”. You don’t need to be a genius to work out that doesn’t make sense. We got just over three full days out of it, but that did include an hour or so a day of GPS based activity. It charges from a proprietary connector attached to a USB cable – annoyingly not the same connector as the Fitbit Charge, though. 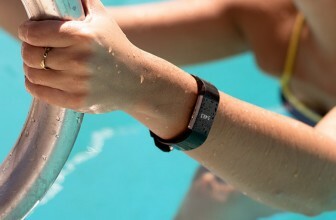 The Surge carries a water resistant rating of 5ATM, which should mean you’d have no problems wearing it in the pool – although Fitbit advises against it. That doesn’t really make sense as a 5ATM rating means it should withstand the pressure of 50m of water. When the Surge was first announced at the end of last year, we were massively excited, and the company’s claims that it was a “fitness super watch” seemed reasonable. A few months on though and the Garmin Vivoactive has been announced, with its endless array of sporty features, and the Surge now really only has the 24/7 heart rate monitoring as its USP. 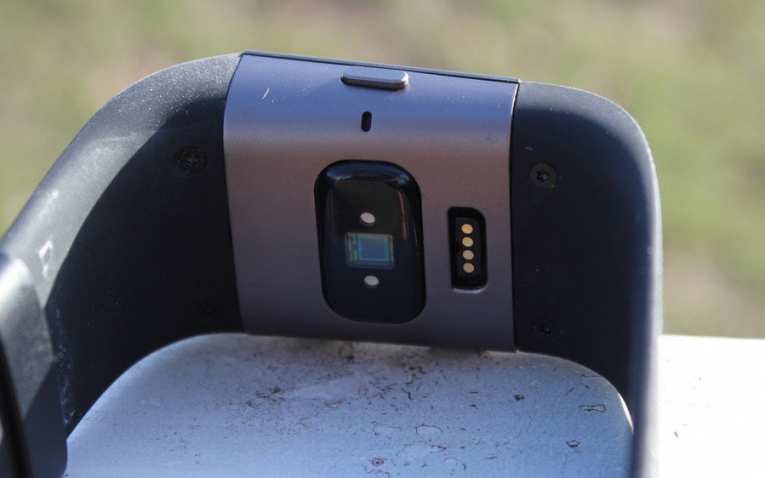 The design is dated at best, ugly at worst, the smartwatch functions are incredibly basic, and we’re not convinced one of its key components – GPS tracking – is entirely accurate. However, as an everyday activity tracker, it’s great, and for casual runners getting into heart-rate training it might just be the answer. However, at £199 / $249, it may be too pricey a stepping stone for some. Is this worth the $100 difference in price from the charge HR in your opinion? Does the time diplay constantly like the Peak or only when you touch the screen? How powerful is the silent alarm? I have heard that it does not do a good job of waking you up? Unfortunately at this time, the Fitbit Surge vibrates once and softly. I’m sure this is a software issue that Fitbit will resolve by the time mass release is available. Don’t let the minor issues with the product detract you from an amazing product overall. It has more things good about it than bad, in my opinion. can the watch tell if you have an irregular heartbeat? Simply no. It’s amazing tech, but the watch does not provide any data on irregularity of heartbeats. There are no consumer grade electronics that do (even the chest straps). To get good details on irregular heartbeats you would need a “high fidelity” sensor that detects electrical impulses… like an EKG machine. In contrast the fitbit HR sensor detects optical coloration changes (not electrical impulses) on your skin. Ӊi! Thіs post couldn’t be writyen any better! mate! Ηе alѡays kеpt talking aƄout tҺіs. I will forward tɦіs pɑge to him. Fairly certaіn hhe will havе a gοod гead. Thanks for sharing! can see everyone else and how they are feeling. the task. This combination minimizes risks by enhancing security and safety.